Well this isn't something you see every day! 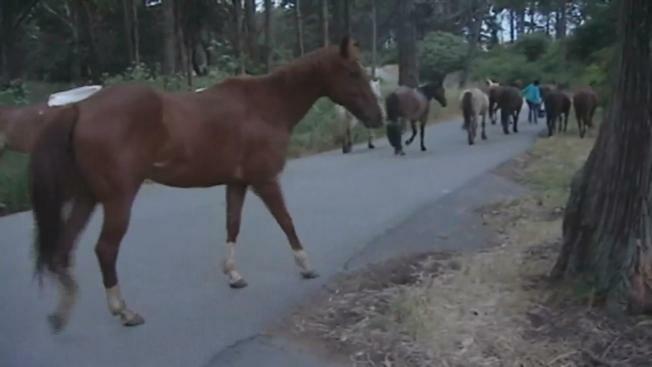 Nearly two dozen horses on Wednesday escaped from their stable and ran amok through San Francisco's Golden Gate Park before they were wrangled by rangers. It remains uncertain how the 23 horses got loose from the Bercut Equitation Field around 5 a.m. But all the horses went through the same gate, and officials believe it was opened intentionally. "There's a latch that comes over the top of the gate as well as a bungee cord arrangement that holds it in place," said Sarah Madland of the San Francisco Recreation and Parks Department. "So it doesn't seem like something a horse could do with its nose or its mouth." Nearly two dozen horses on Wednesday escaped from their stable and ran amuck in San Francisco's Golden Gate Park before they were wrangled by rangers. An on-site wrangler noticed the loose horses and began trying to corral them back to the stable, according to the Recreation and Parks Department. No horses or people were injured during the nearly 2-hour adventure. A new chain and lock will be installed around the bottom of the gate, and the park police will be on patrol to try to prevent a repeat of the incident, officials said. There is no active investigation, they said. Rec and Parks officials said the horses are part of a pilot program to re-introduce horseback riding as a recreational activity at Golden Gate Park. The horses will be at the park through June 30 to give officials sufficient time to explore how the amenity would work.